Along with the introduction of 2014 Z1000 and Z1000SX at the 2013 EICMA, Kawasaki had also revealed the all new Z250 at the Tokyo Motor Show in November 2013. Kawasaki’s Z250 is in fact the street version of Ninja 250 with styling cues obtained from the bigger siblings Z1000 and Z800. New 2015 Kawasaki Z250 ABS version will be 2kg heavier than the model it is replacing. 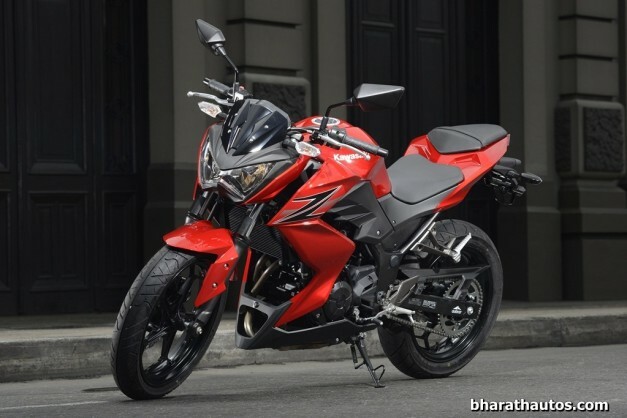 Kawasaki’s Z250 was recently launched in the month of October 2014 at a price tag of INR 2.99 lakhs (ex-showroom, Delhi). Since its launch, after being tested by several customers, the only complaint was lack of ABS which was actually not offered in Kawasaki’s Z250 globally apart from Kawasaki’s home market Japan. In response to customer’s feedback, Kawasaki has finally announced that all new models delivered starting this year would feature a slipper clutch and ABS as standard equipment. Introduction of slipper clutch and ABS as standard equipment in Kawasaki Z250 would in turn increase the price which is already very high when Indian consumers are kept in mind. Coming to the technical specifications, the Z250 is powered with 249cc parallel-twin engine producing a maximum power of 31.5 BHP at a maximum torque of 21 NM. Previous articleSpyShots: Yamaha D’elight spotted in India, launch on-cards! Next article2015 KTM RC Motorcycles could get Slipper Clutch!